For people who were already able to go to Singapore Jewel Changi airport and see all the new shops (especially the fabled only A&W branch in our part of the world at the moment), a lot of bloggers and even ordinary citizens have certainly featured the “architectural marvel” on their social media, videos, and blog posts. Vlogger Nuseir Yassin, more commonly known as Nas Daily, has been increasingly popular in the context of Singapore, especially after he expressed that he was moving to live here. The Arabic YouTube content creator has such a distinctive voice and personality on his videos that one Singaporean has already made a video ahead of the Arabic vlogger. YEOLO, a Singaporean vlogger, Instagram user, and suspected meme lord, had uploaded the video, using NAS Daily’s distinctive tone and style, while poking fun at the newly-opened Jewel Changi airport. In the video above, he didn’t call Jewel Changi an airport but actually a shopping mall. We could concede that point, as people may be going to the location more for the shops and exclusive restaurants than their flights. He pokes fun at how Singaporeans don’t want a non-Chinese minister, also that we would prefer foreign brands and restaurants instead of our own, who serve food wildly different from our beloved hawker stalls. 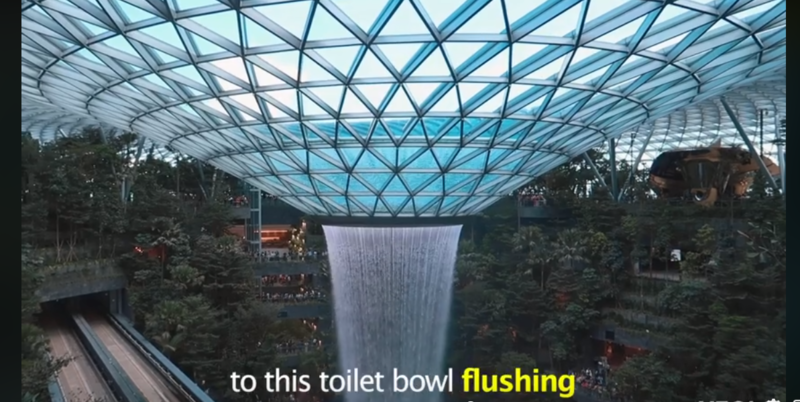 He likens the huge waterfall that’s the centerpiece of Jewel Changi to a continuous flushing toilet without the nasty bits. All in under one minute, too. While Jewel Changi is a singular structure in Singapore and si definitely worth a look (preferably when there is less of a hype surrounding it). But it isn’t without problems. According to one Facebook user, the flowing water isn’t restricted to the large waterfall, and airport workers have been seen in an endless mopping cycle trying to control a flood of water in an Arrival Hall in Jewel Changi. According to a report, this happened on April 13, and that the airport authorities finally got the leak under control. But another leak then happened in another place in the airport. While this is really a disappointment, any newly-opened structure is sure to have its ups and downs. “The issue was quickly attended to and resolved with minimal impact to operations,” they added. Another interesting thing to note about the airport is that while the whole thing is not actually shaped like a jewel but actually a donut, Canadian architect Moshe Safdie said that the structure is extremely difficult to design and build. The center of the donut which is of course the waterfall is also off-centre. He had allegedly taken heavily from James Cameron’s movie “Avatar” for inspiration when it came to designing the airport. He was also the designer for Marina Bay Sands. PreviousWho is Jacqueline Wong Sum-wing (黃心穎)? NextEnd of the road for Andy Hui and Sammi Cheng – “Hong Kong’s last fairy tale”?